This is a feature comparison of text editors on iOS. The information was initially compiled by the web community on an open Google spreadsheet. It’s meant to help you find the most useful way to write, code or take notes for your personal needs. Every editor is geared toward a slightly different purpose, with their own strengths and focus. Hover over an app’s title in the chart to see additional features which might not be included in the default criteria, and click the app name to scroll to its full data block. Holding down command while hovering over the body of the chart will highlight the current row, and clicking a row will highlight it permanently. Clicking a feature header at the top will filter to show only apps that have that feature. App details below the chart are pulled live from the App Store API. This tool is only useful if it’s accurate and up-to-date. 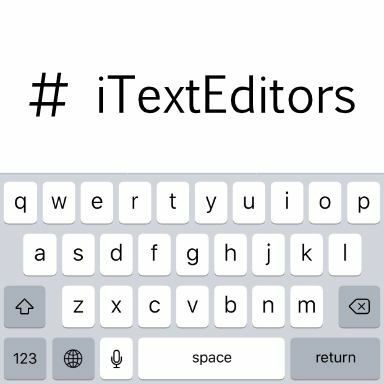 If you’re the developer of an iOS text editing app (or a dedicated user), just use the submission form to request a listing. Corrections welcome, just use the same form and edit only affected fields and/or add a note at the bottom. Be sure to include contact info! No, I didn’t. See above. If you Tweet me and tell me I forgot something, I’ll know you didn’t read this. If you’re editing Markdown, there’s a great Mac app called Marked that previews your work, updating every time you save. If you’re editing on an iOS Dropbox or iCloud-capable application, you can even preview iOS work on your Mac as the document syncs back to the cloud. It can also export PDFs, Rich Text and HTML with a variety of themes and the ability to customize with CSS. It’s neat. I know because I wrote it. Mobile version. I’m still trying to figure out how to make this more workable on iOS, since that’s where it makes the most sense. Kinda doing this backwards. Last updated Wednesday April 03, 2019 at 08:23am CDT (v256). Flexible folder manager with Dropbox and iCloud support. Hashtag to group and filter documents. Share document and to-dos to other apps via custom actions. One-tap formatting on iOS with a custom shortcut bar. Code complete, shows functions, struct fields, etc. Support for multiple flavors of Markdown, Taskpaper and other syntaxes. Export as HTML or RTF. iCloud sharing with other Keep It users. Create / append text and links with Share extension and Shortcuts. 5 typefaces and 4 themes. Create and design table like a Pro. Export to PDF, RTF (Microsoft Word Compatible), HTML and TXT. Copy formatted text to iOS mail app to email any part of your document. Local & Dropbox file manager. Extra keyboard row & popup menu for quick access to writing & formatting features as well as extra symbol/characters. Intuitive input system as you type, such as: bullet & numbering creation, heading, indent, etc. Navigate document easily with dedicated navigation keys. Full external keyboard and shortcut support. View document outline and jump to any heading. Live words & characters count. Convert to multiple formats RTF, Markdown, PDF, ePub, HTML, RTFD, TXT, etc. Support for offline local copies of files. Support for iOS "define"" popover"
Generates Unicode plain text, so any code comprised of that may be produced—HTML, Markdown, etc. Streamlined editing interface with customizable themes. Organize notes with colored tags. Save note archives to Dropbox. Vimscript works out of the box. As of 3/29/12, 70% off. The Next Web - iPad text editors: Which one to choose?